I just got back from a local art fair, so it occurs to me that the Hubble is kind of like its own ready-made exhibit. I get lost in those images more than any paintings or sculptures, and space never fails to generate paradoxes and mind-boggling patterns. Today’s space news involves two such offerings: a particle collider and the best picture of the Milky Way, along with thousands of other galaxies. While we have painstakingly created our own impressive particle colliders, the cosmos can do us one better. 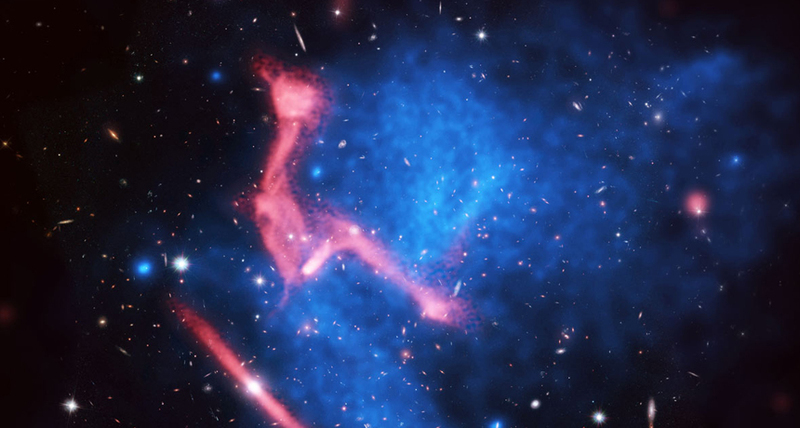 Five billion light years away, there’s a collision of galaxy clusters that are forming an accelerator estimated to be a million times stronger than the Large Hadron Collider. Clusters of this sort are the largest structures in the universe, and can consist of thousands of galaxies that continue piling up over billions of years as a result of collisions between smaller groupings. This latest discovery is a result of four galaxy clusters smashing together, which heats up the areas between the collections. Charged particles approach the speed of light as they ride a 2.5 million light-year-long jet of hot gas. The four bunches together have the mass of approximately three million billion suns, and heat the interstitial gas to 100 million degrees Celsius. Of course, the collision actually occurred billions of years ago, so who knows what it looks like now. But instead of imagining what that galaxy cluster collision looks like now, we can distract ourselves by looking at other beautiful images—specifically, one of our own universe. 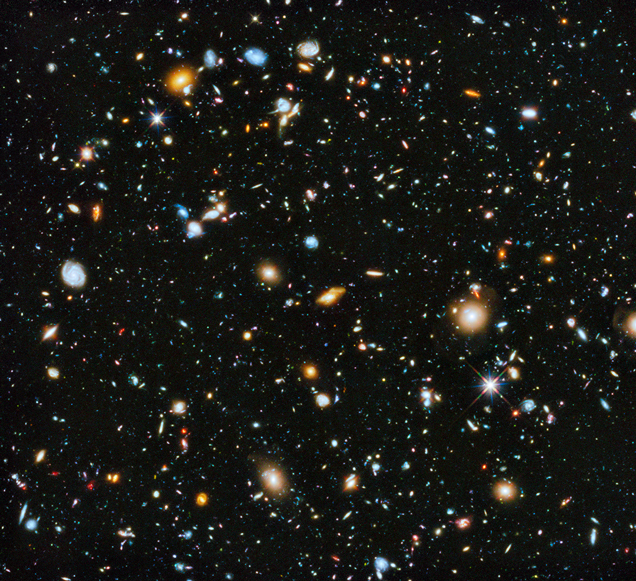 NASA recently released the most detailed and incredible image composite of our universe to date, obtained as part of the Ultraviolet Coverage of the Hubble Ultra Deep Field study. The imagine isn’t a single photo, it’s actually “a composite of separate exposures taken in 2003 to 2012 with Hubble’s Advanced Camera for Surveys and Wide Field Camera 3” over the course of 841 orbits. 10,000 galaxies exist within that image, some of them ancient, forming hundreds of millions of years after the Big Bang. Hubble’s ability to detect ultraviolet light is what allows us to see galaxies 5-10 billion years old, back when they were busy, star-making teens. It seems impossible for a single image to capture so much time and space, and it’s easy to look at such a picture and regard it as art, rather than as a place that exists—and has infinite potential to blow our minds.